Cowal is an excellent holiday base for walking. It is possible to enjoy gentle and exhilarating walks from the door of your cottage. Very near, there are short walks along Forest Enterprise routes, or longer walks along the shores of Loch Goil or Loch Long. The rugged terrain of the mountains and hills of Cowal, Argyll and the Trossachs combined with the fabulous views of glen and coastline, provide exceptional walking and there is plenty of choice. Cowalfest is a major walking and arts event taking place each year in October. Cowalfest Walking and Arts Festival is one of the largest and most varied walking festivals in Scotland, with more than 80 walks led by expert and knowledgeable walk leaders including National Park and Forestry Commission Rangers. For some walking with fabulous views yet with easy access to the town of Dunoon, try Dunoon's Forests. The forest landcape is open and bright with many ages of woodland, and thriving bird, animal and plant life. There are a range of walks from 1.7km - 5km but also the Corlarach Loop, a dramatic walk that links the Ardyne and kilbride car parks and offers several clearly marked route options from 13.9km - 27km. For more information, visit the Forestry Commission Website. Often described at the most exhilarating mountain group in the Southern Highlands, the Arrochar Alps form the northern boundary of Cowal. The best known hill within this compact group, Ben Arthur, is commonly known as the Cobbler because if its distinctive shape. The hills around Lochgoilhead make this an exceptional walking area. There are good forestry roads and paths, as well as some rough walking Ben Bheula (779m) which towers above Loch Goil. Loop walks of the ‘Cowal Way' and the Cowal Way itself pass close by Ben Bheula, between Invernoden & Lochgoilhead. The pinnacles on Carnoch Mor are worth a mention. 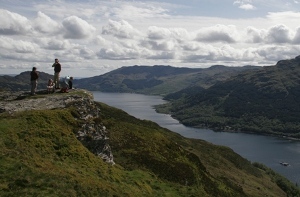 The hills between Loch Goil and Loch Eck, though less high, are remarkably rewarding for hill-walkers, with scintillating mountain and sea views.